C/ de La Playa s/n, Urb. 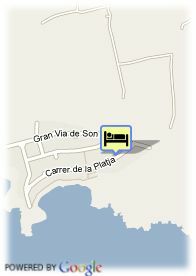 Son Xoriguer, 7769 Ciutadella De Menorca, Spanje. This complex located in Cala d´en Bosch with a small colonial resort's style, offers wonderful views over the Mediterranean, a wide pool area in the middle and enviable gardens. Grupotel Playa Club is a grear choice for families and couples. It is located few meters away from Son Xoriguer beach, so having a small walk yo can get to Cala En Bosch and its Leisure Port. Its apartaments and all its facilites invite the whole family to enjoy a unforgettable holiday thanks to the familiar atmosphere offered by the entertainment staff. In the small relax area with conditioned pool, sauna, massages and treatments, you will find some relax after a long day in the beach.